Sunday was once again one of those days on the calender that many people have different opinions on - Father's Day. I know many people who sneer at the day and call it just another day to lure a susceptible and gullible public into spending more money than they can afford and I have to admit that to a certain extend I tend to agree with them. If all the day means to you is going out and buying a hasty, thoughtless gift and going out for an extravagant lunch, then indeed it is only a commercialized day on the calender. However, to me Father's Day is a special day. It is a day to celebrate the wonder of having had a wonderful man in my life that I could call "Pappa". A man that embodied everything the word "Daddy" implies. It is also a day to give thanks for the wonderful father my daughters have in their lives. There is such a special bond between a father and his children. It is a totally unique relationship. It is a very important relationship, and no other loving relation, be it mommy, granny, brother or uncle can ever be a substitute for that important figure. It is a father who shows his son the man he is to become. To his son he is the strongest, bravest and fiercest man. A father is Sir Galahad and the terminator rolled into one. Silently he teaches us right from wrong and we know he is always there, looking out for us, keeping us safe, protected. With her Daddy's arms folded tightly around her, a little girl feels like a princess, treasured and nurtured. He makes the whole world seem magical. 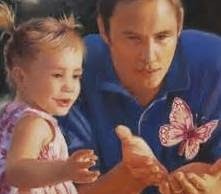 A daddy is most often the biggest influence when his daughter one day chooses that special man in her life. A father also teaches his children about the Lord, our heavenly Father. Through his actions the nature of God is revealed. A child who experiences his father's unconditional love, kindness, fair justice and guidance, and witnesses his father's strong morals, finds it easier to understand the essence of God, and is able to build a strong relationship with his Heavenly Father. Mere words could never be enough to describe the special father my dad was to me. He still is my hero. He was a gentleman; my mom would say, with a twinkle in her eyes, a ladies-man. I never heard him utter a foul word or tell dirty jokes. He taught me biblical principles, not just with words, but by example. His family always came first. He had an amazing sense of humour and we were constantly laughing, he was such a jovial fellow. He loved playing pranks! These are but a few things which I will always treasure about my dad. If there is one thing I regret it is not telling him more often how much I loved him. Ever since my daughters have been born I have instilled in them a love and admiration for their father and I have watched how that relationship grew. They are truly their Daddy's girls. I love watching the interaction that they have with him, their special bond. The way they so easily laugh together and tease each other. The way they value his advice and relish his little eccentricities. How blessed we are to have fathers in our lives. They enrich our lives, they protect and care for us. They give their lives to us without hesitation. Don't wait for Fathers day to pass this way again, take a moment right now to tell your dad, or your husband, how much you appreciate him. If you flutter by here and would like to share something with us about your father, please feel free to comment.